I just came back after another brilliant Spirit of Youth session. I can honestly say that I didn’t stop smiling for the entire 90 minutes. It was the first session after two weeks away and the children and residents were very excited to be back. One of the residents, Amanda, said “It has been too quiet without them. We need them to make some noise and wake us all up.” And noise they certainly did make. Right on cue you could hear the children bounding up the corridor, eagerly chatting. As soon as they came into the room the children ran straight up to their older buddies and gave them a big hug. Lee could be heard saying “Hello, Grandad. I’m back again.” Fred, the resident on the receiving end, was clearly choked by the overwhelming affection. The children had plenty to tell us, so we started off with a mutual sharing of news. On week one we paired them into buddies, with one resident and one child working together as a team to complete various tasks. This week in their buddies we gave them three minutes to tell each other everything they did over the last two weeks. They then had to agree on one activity to mime together. The rest of the group had to guess what it was. After recapping the story, we handed them the start of our A Midsummer Night’s Dream script. I have based the script on their devised versions of the story before half term and mixed their dialogue with a healthy dose of Shakespeare. “We are like proper actors now.” said Madison, one of the Weyfield children, as she eagerly rifled through the script. 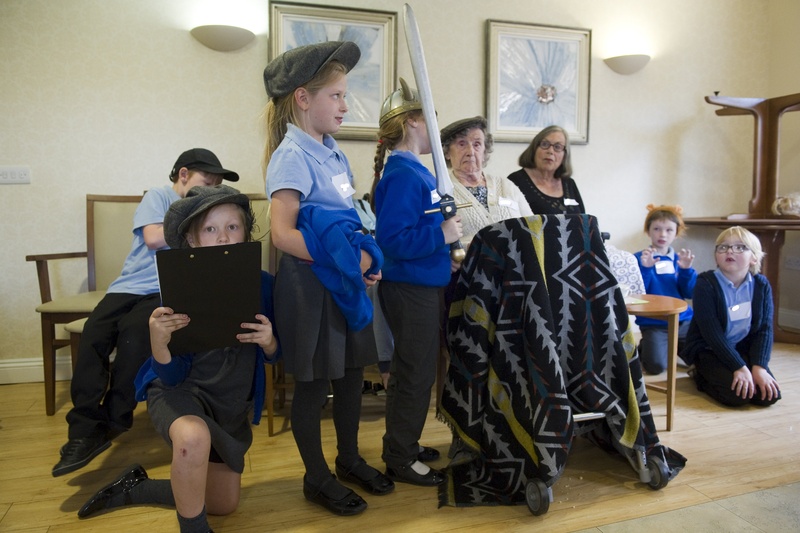 The children and the residents helped each other to follow the script and the pronunciation of any difficult words. I was very proud when one of the children, Dougie, shot straight up to help Irene, one of the residents, who was confused. He held her script and followed it carefully with his fingers to help her keep her place. After all, Irene had very important fairy business to do with her hands. She is very good at casting spells and making flowers fly across the room, all whilst sitting in her wheelchair.